I first visited the northern region of the Escalante Staircase area years ago after reading an article on the Burr Trail -but that’s another story. More recently (back in 2007) I hit it from the south, having come up one night from Flagstaff and checked into a hotel in Page, Arizona just off Hwy 89. There was a large canvas hanging on the wall of the lobby and I asked the woman behind the desk where it was from. “Just up the road,” she said, “about 20 miles. It’s not marked or anything, you just pull over the start walking.” So that next day we did just that and what do you know – we found it. Small, un-obvious ‘Grand Staircase-Escalante National Monument’ sign marking the trail head along Hwy 89 North out of Page, Arizona. This past trip to Page we thought we’d try to find it again. One late afternoon we set out armed with just a memory and full tank of gas. Soon the land began to change into what I vaguely remembered from 10 years prior and I was hopeful. Then, there on the right hand side of the road was the parking area and it all came back to me. It’s more developed now; a half dozen cars at the trail head and a sign informing would-be hikers what they’re about to see. It’s the Grand Staircase, part of the enormous Escalante National Monument. Different than a National Park, National Monuments have different structures, different protocols. 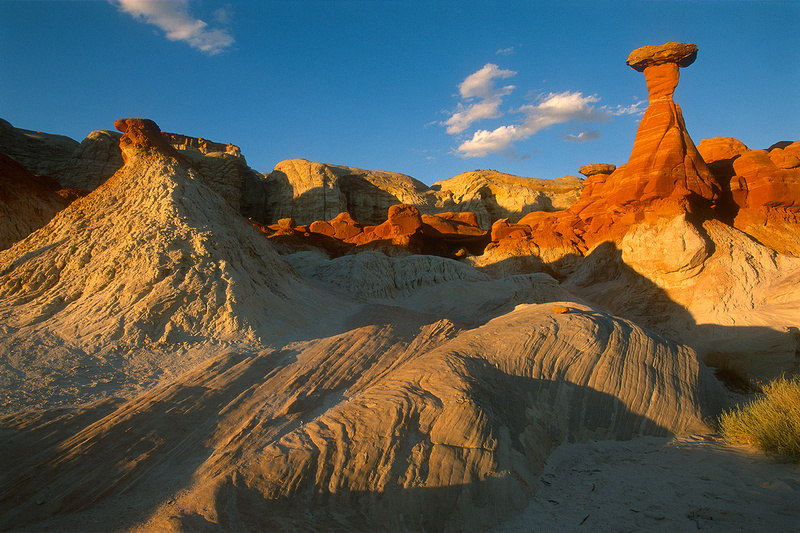 The Escalante National Monument is a truly vast, wild expanse of land sweeping through central Utah. There’s no single entry point per say, but numerous portals from which to enter. Camping is allowed and exploration is encouraged. It is a able-bodied photographer’s dream come true. Grand Staircase, Escalante National Monument, Utah (2016). The “staircase” feature of the Escalante Staircase is series of risers, or elevated plateau regions ranging from the Grand Canyon way south in Arizona to the the 9,000′ edge of Utah’s high plateaus. 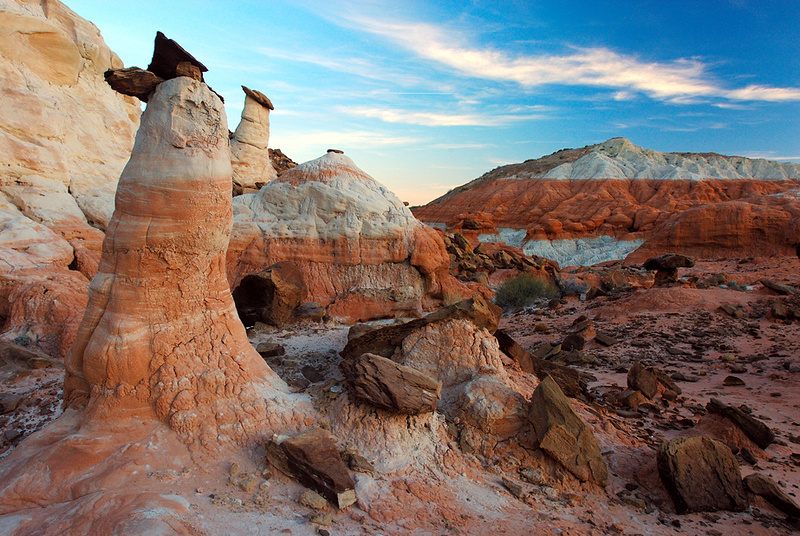 The ‘steps’ include prominent geologic regions such as Shinarump Cliffs, the Vermilion Cliffs, the White Cliffs, the Gray Cliffs, and the Pink Cliffs. In this shot you can see some of that transition, showing the comparatively whitish layers between the Carmel Formation (in shadow) and the Entrada Sandstone layer ignited by the setting sun. Nikon F6 + AF-S NIKKOR 17-35mm 1:2.8D + Velvia 50. 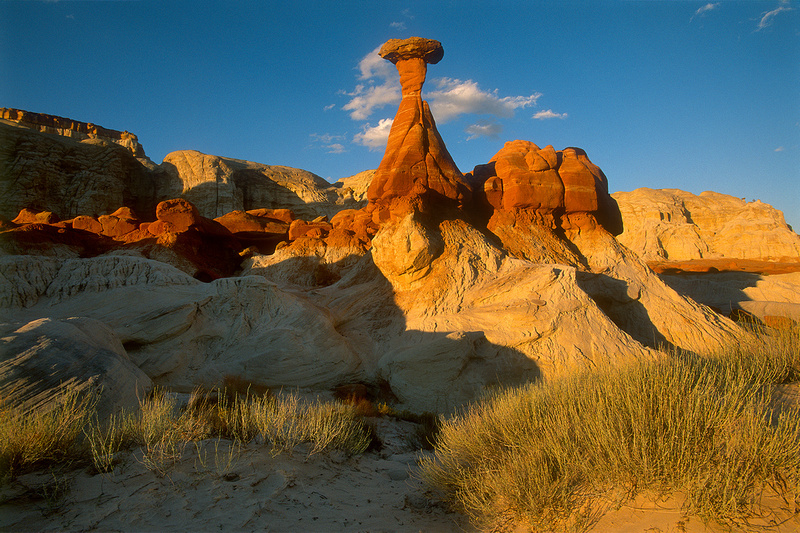 Toad Stools, Grand Staircase, Escalante National Monument, Utah. Much of the area seems to be in some transition between dirt and rock. Cryptobiotic soil (organic matter that takes many years to grow) is everywhere. Sadly, boot prints trample these hearty organisms constantly, forcing them to start the regeneration process over regularly. So what does this have to do with the F6? Nothing, really – other than it’s just another place it was with me to record. Ten years ago before purchasing the F6 I was shooting a D2oo. The difference between the two cameras is startling. My friend Dan looked through the F6’s super bright, clear viewfinder and – in comparison to the D750 he was shooting – commented how he wished the D750 had that viewfinder. Funny how we grow accustomed to things and can take them for granted. The viewfinder is one of the features of the F6 I’ve come to rely on most. I’m actually able to see well enough for tasks such as manually focusing and low-light shooting. And compared to the F5, because the focus points light up in red instead of remaining a monotone gray when activated makes everything easier and less distracting when shooting. Yet another reason to love the F6. 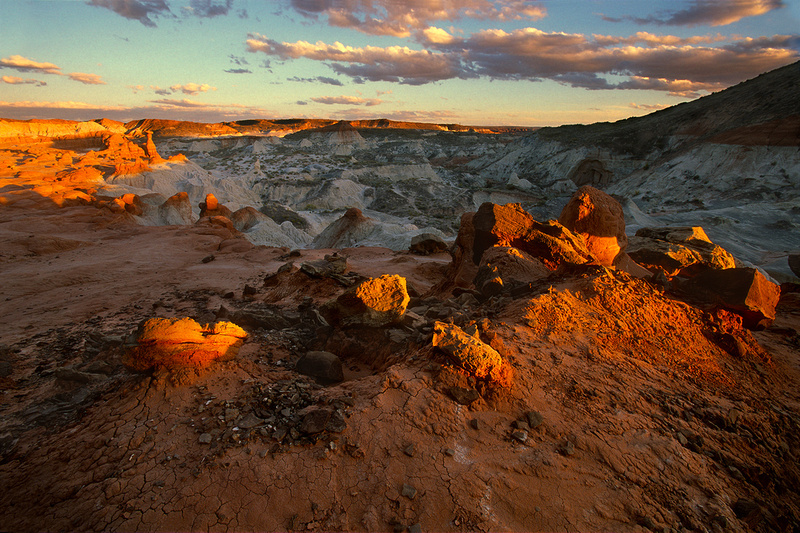 To read more about Utah’s Escalante National Monument and Grand Staircase, visit the VisitUtah web site. In 2007 we called this area “Rim Rocks.” I’m not sure why, or where the name came from. Now it’s part of the Escalante National Monument’s Grand Staircase area. Nikon D200.